The portable rotary degasser was designed for use in foundries that melt Aluminum in batches of 70 to 900 lbs. It has been used effectively in crucible, dip-out and tilt furnaces on melts ranging from 40 to 1500 lbs. We have been using the portable rotary degasser for many years to degas our 90 lb. crucibles and 200 lb. ladles. Degassing times for these melts have ranged from 1 to 3 minutes. There are more than 300 units in the field. Designed as a portable, low-cost alternative aluminum degasser. Stainless steel construction enables this unit to withstand the corrosive and abusive high-temperature environment of the foundry. It can be used with argon or dry grade nitrogen gas for a safe working environment. The low profile lance design reduces cost and eliminates turbulence in the melt produced by the two piece shaft impeller designs currently available. This unit provides low cost lightweight (under 50 lbs.) degassing previously unavailable to foundries. Hydrogen degassing of aluminum works on the principle that the hydrogen gas will move from an area of high pressure (in the melt) to an area of low pressure (the inert gas). Hydrogen gas disperses in the molten metal as it would if it were released in the air. It will maintain an even pressure throughout the melt. When you introduce the inert gas, the hydrogen in the metal will flow into the inert gas. As Hydrogen gas is removed, it will equalize its pressure throughout the melt. The ability of hydrogen gas to move through and equalize its pressure in liquid metal is almost as fast as it is in air. It is therefore unnecessary to bring all of the metal in contact with the inert gas. Two factors, the transfer rate across the metal/gas interface and the surface area of gas exposed to the metal determine how well and how fast a heat of aluminum can be degassed. Gas bubbling hydrogen degassing systems work on the principle of using specialty gasses (chlorine, Freon or SF6) to speed up the hydrogen transfer across the metal/gas interface to large bubbles of gas in the metal. There is a practical limit to the hydrogen removal on humid days because the large bubbles break the surface and expose metal to the humid atmosphere where more hydrogen was picked up. Chlorine was the original gas of choice because chlorine combines with hydrogen to produce hydrochloric acid so the bubbles never became saturated with hydrogen. Because of the hazardous nature of chlorine gas and the hydrochloric acid vapor byproduct most foundries switched to other gasses. What most foundries have not considered are the hazardous materials released by the breakdown of some of the specialty gases currently in use. Rotary degassing works on the principle of increasing the surface area of an inert gas exposed to the metal. The greater the surface area, the faster the degassing. For a given volume of gas the smaller the bubble size the greater the surface area and the faster the degassing. For example a 1" square bubble of gas has a surface area of 6 square inches. If you divide this bubble into 1/16" square bubbles, the total surface area increases to 96 square inches. So for the same volume of gas the surface area and therefore the hydrogen transferred to the gas bubble has been increased 16 times. Additionally small bubbles do not disturb the surface of the molten metal so there is very little hydrogen pickup from the atmosphere. We have only used our rotary degassing equipment with Dry Nitrogen or Argon gas and we do not guarantee compatibility with specialty gases or gas mixes. With the exception of the graphite lance all internal parts exposed to the degassing gasses are type 304 stainless steel and the seal's Buena-N. Experience has shown that dry nitrogen or Argon used in a rotary degasser will degas 400 lbs. of aluminum in four minutes or less. There is no practical reason to use a specialty gas that may cost $500.00 per cylinder when dry nitrogen can be purchased for $25.00 per cylinder. In addition there are no toxic emissions from nitrogen gas. 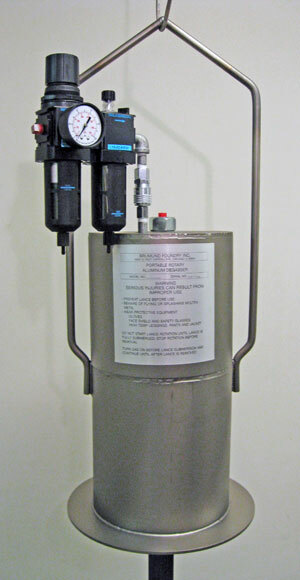 The degassing unit with combination air regulator/filter/lubricator and 4 graphite lances cost $2,916.50ea USD plus shipping. If our degsser is not suitable for your application it may be returned, within 30 days from the date of purchase for a full refund. The only expense you will incur is the incoming and outgoing freight. Brumund Foundry warrants that all degassers will be free of defects in material and workmanship for the first 120 days after purchase. Brumund Foundry will replace any part that fails for any reason for the first 90 days after purchase. The only exception to the warranty is the air drive motor. There are no user serviceable parts in the air motor. The warranty is void if the air motor is opened. All lances in stock for immediate shipment, call for quantity pricing. Call for pricing and availability 773-287-9250 or email. 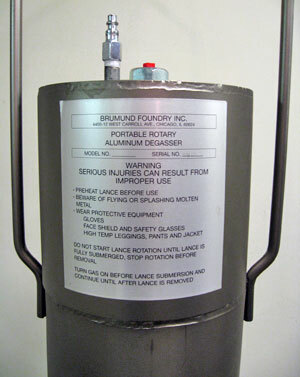 The degassing unit offered above was designed to be portable. We have produced several custom units to fit customer requirements. We are willing to modify the degasser to fit your application. Contact us with your specific needs. Are you interested in distributing or selling our degasser? Contact us for dealer pricing and available territories.